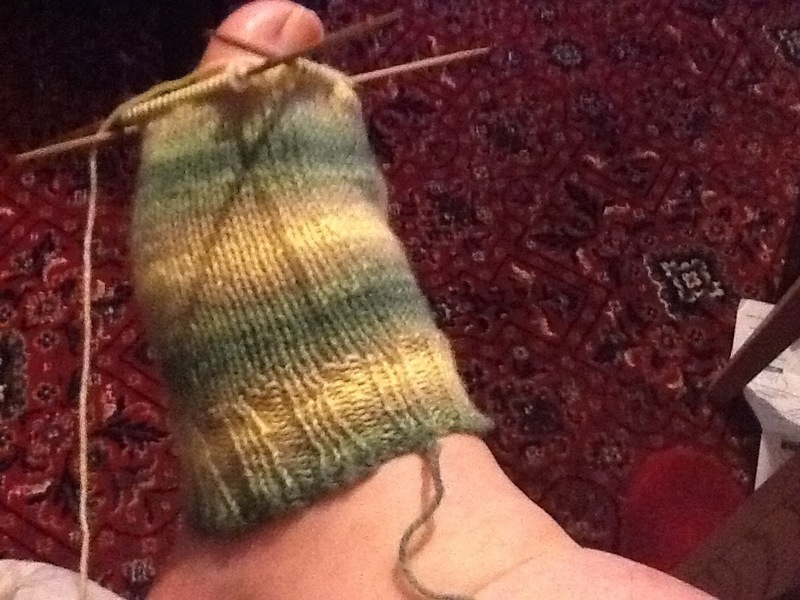 If, like me, you’ve tried knitting socks only to rip it out because it just doesn’t look right, this one’s for you. I’m not trying to exclude those who know their stuff, please comment with tips and encouragement, but you’re not really gonna learn anything. I’ve not yet got to the point where I like what I see well enough to keep it going, so I’m going to take it nice and slow this time, breaking it down, researching the problems I encounter, and taking breaks as and when I need to because learning a new skill can be so tiring. I’m gonna be adding info and pics as I go, then wrapping each post up and publishing it on Monday. I started on Tuesday, see, and wanna show how it progresses through each week, even if I can only show how many extra rounds I got done. I will be doing this for as long as it takes, please give me feedback. There’s certain things, like yarn, that it’s a given you need and others that I just plain forget may help or not know why that style is best. So I’m gonna explain what I’m using and why. O 100g sock yarn If you don’t know what to look for, you’ll want 4ply superwash wool with a nylon binder. I also know of 3ply and other fibre being used, but those are too tricky for something I’m already having difficulty with. Been there, lost patience with that. 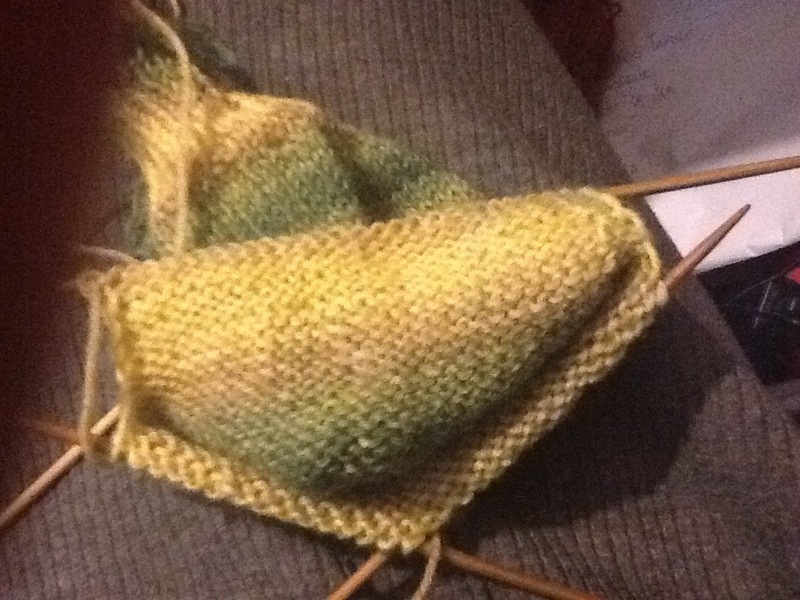 I am using Zitron XXL in shade 1002, which selfstripes in green and yellow and works up prettier than the pictures will show. O a simple patternMine is a sock and gift bag pattern that you can get free with the linked yarn. It’s easier to understand than other patterns I’ve tried, but only shows sizing for a woman’s medium, which roughly translates to the UK standard 4-7. 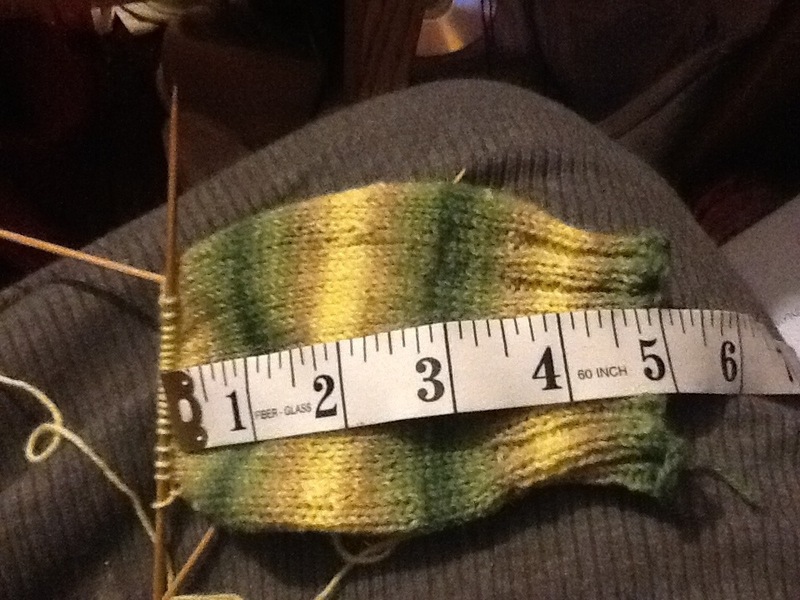 If the feet that you want socks for are not the right width for these sizes, then find a pattern that you like and makes sense to you. I will be referencing my pattern as we go along, so it’s not a dealbreaker if you want to just pick things up from here. O 2-3mm double pointed knitting needles My pattern worked with 2.5mm for the gauge, but sock yarn generally works with 2-3 depending on the gauge.I started using 20cm bamboos cos that’s what I had, but if you have choice those are best cos you want grippy not slippy. O Closed stitch marker markers with moving parts make things so much more stressful here, as you just can’t slip them as you go without them slipping off. Use those if that’s all you’ve got, but allow for extra annoyance. O snippers yarn snips are best for cutting the yarn neatly without tearing it or jabbing you. O row counter there’s plenty of options that don’t go on your needle, cos those are chunky and heavier than you need, but if that kind is all you have you can use it in place of a stitch marker. Otherwise, there’s apps where you type the number in and the Kacha-kacha that stands on the table (and gets mistaken for a gum ball machine) and Mini Kacha that you can wear (which looks like a smiling frog). There’s also bracelets that are meant to work kinda like an abacus, but I dunno how. Before casting on, I checked that my gauge was right. 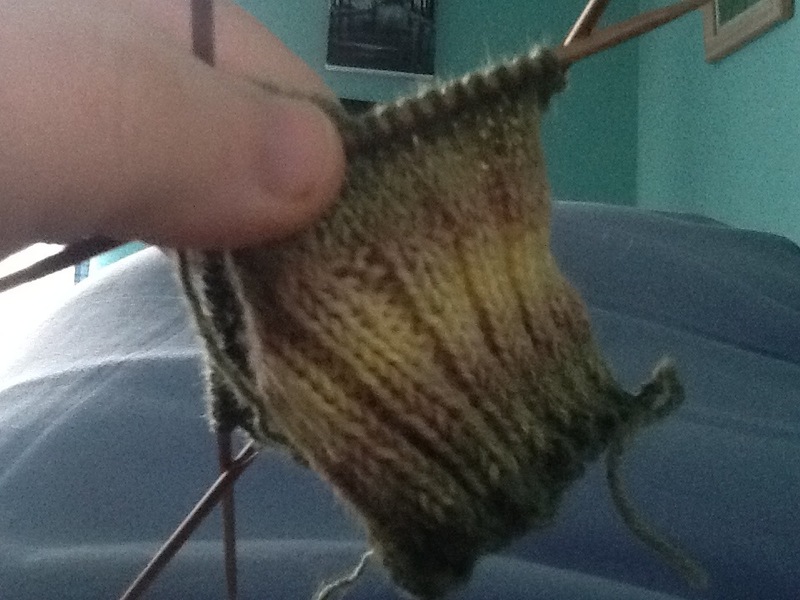 My pattern called for 36 stitches and 48 rows per 10cm/4inch stockinette square on 2.5mm needles, which I had trouble with at first cos I tend to loop loosely. I had no small dpns, so had to find a way of working tighter on the ones I had. 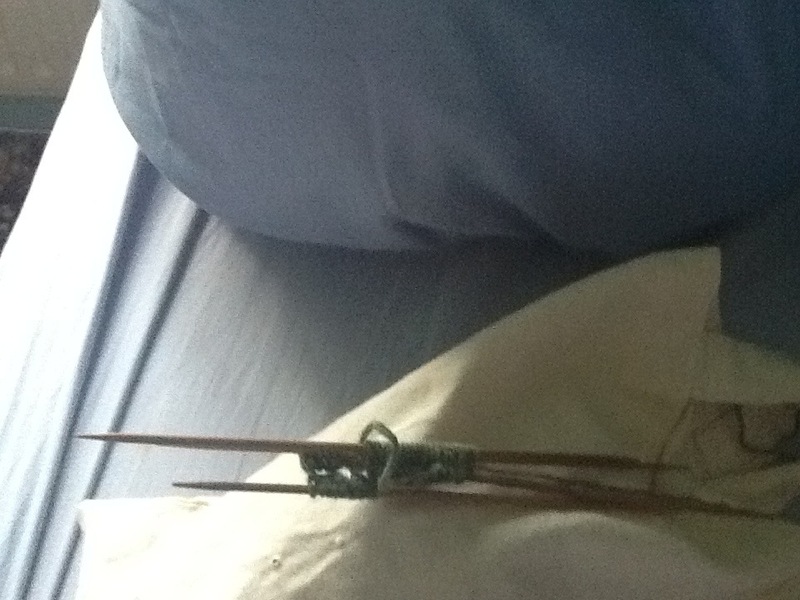 After a bit of experimenting, I discovered that wrapping counterclockwise gives me tighter gauge and made it so I didn’t have to hunt down skinnier sticks. If you don’t have dpns already, do your gauge swatch on single points in the size recommended and work from there until you know which size you need. Once the stitches are cast on and you’ve recounted them, they’re divided over 3 needles (sometimes 4, your pattern will tell you which if it matters), with 20 stitches per needle in my case. The way to do that is to start from the first stitch cast on, stick one of the empty needles into it and move stitches until the right needle has the right number on it, recount, and do the same with another needle. Get all the stitches facing inwards and lined up so that the needles with the first stitch and the trailing yarn sit over the other needle. 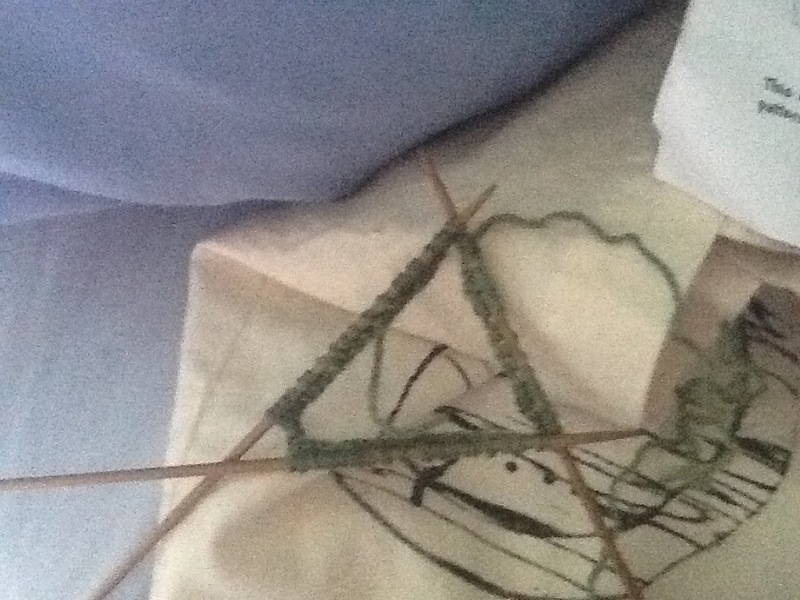 When it looks all triangular (you’re not gonna have a triangular sock, because I was kinda scared thinking that), you’re gonna join your stitches. I’ve just learned myself by trial and error how to join without swapping stitches about or having a strand running between them. 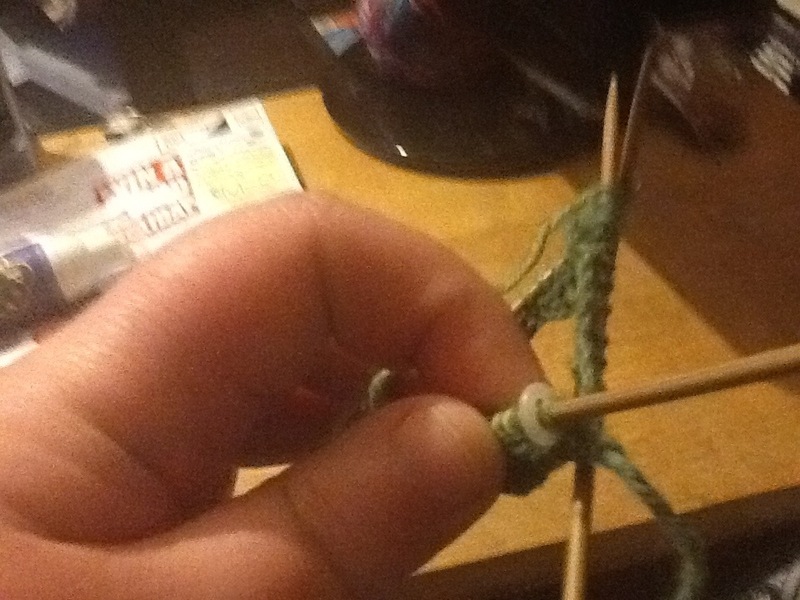 Keeping the triangular shape, hold your needles so the slip knot is one the left and the trailing yarn on the right. Pull these needles so that the left needle rests over the right with no gap and the slip knot is against the last stitch. Hold the needles together with your right thumb at this point, and bring your fourth needle in to knit the slip knot stitch as tightly as you can. You’re also gonna wanna wrap the yarn a lil tighter for the first stitch of each needle to gently bring the last needle into alignment with it better. 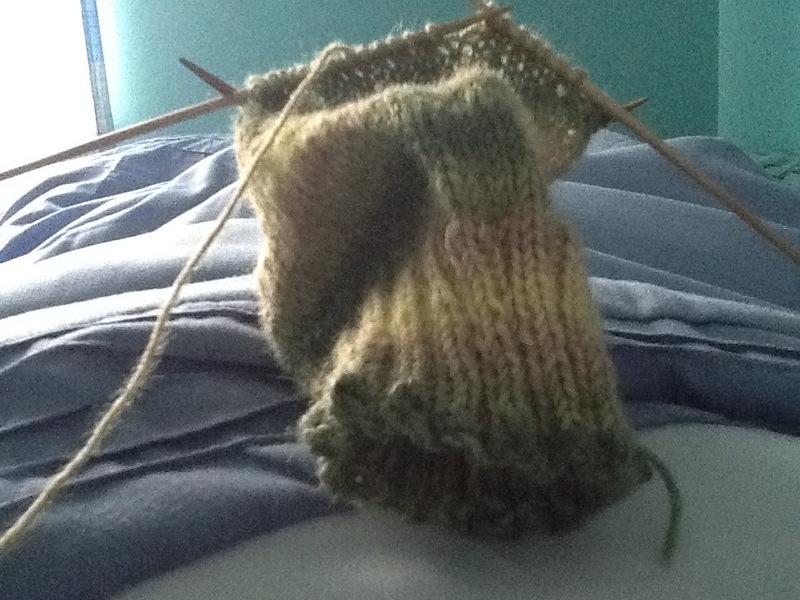 Most sock patterns that start from the cuff (known as cuff down) uses knit 2 purl 2 ribbing, and that’s what my pattern calls for. 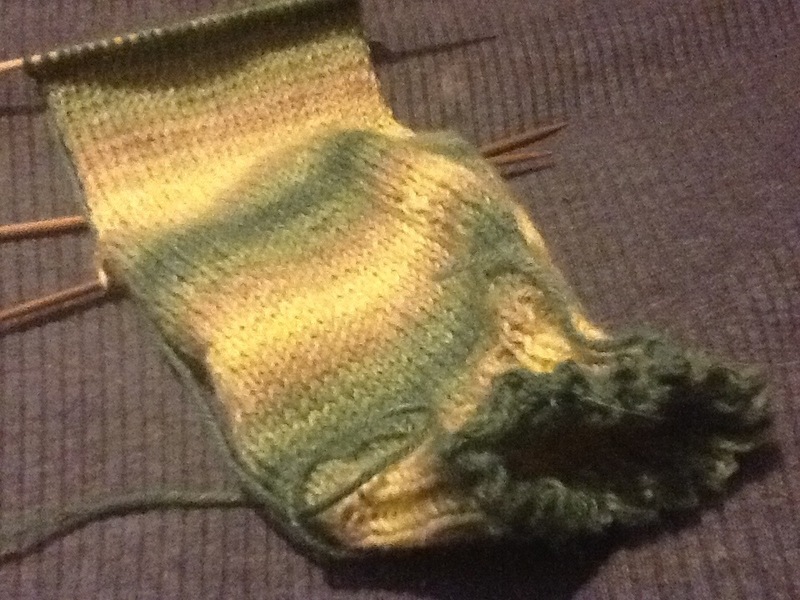 Knit the first stitch a little tighter than usual, and then you can let go with your right hand and loosen a little. The beauty of circular knitting is that you’re always working with the right side facing, so can just progress round with none of the loathsome flipping until you’re all done. And if you’re getting bugged cos you can really see lil chinks of light through the stitches, don’t panic. Your work is at it’s most stretched by being on the needles, so it’s unlikely to look like that when worn (and anyone spotting it then if it did would really have to get down there with a magnifying glass, so if it feels good when you stick an appendage through it’s just fine. When you need to do something else or have trouble concentrating (I put the latter as a given cos I sure hope I’m not the only one who has to step away so I don’t mess up big time), tuck your triangle down as above, and put everything safely in your bag. Do NOT work your sock while watching tv, cos I had to rip mine twice cos I lost concentration. And if you ever have real trouble collapsing your work, your work is a smidge too tight. 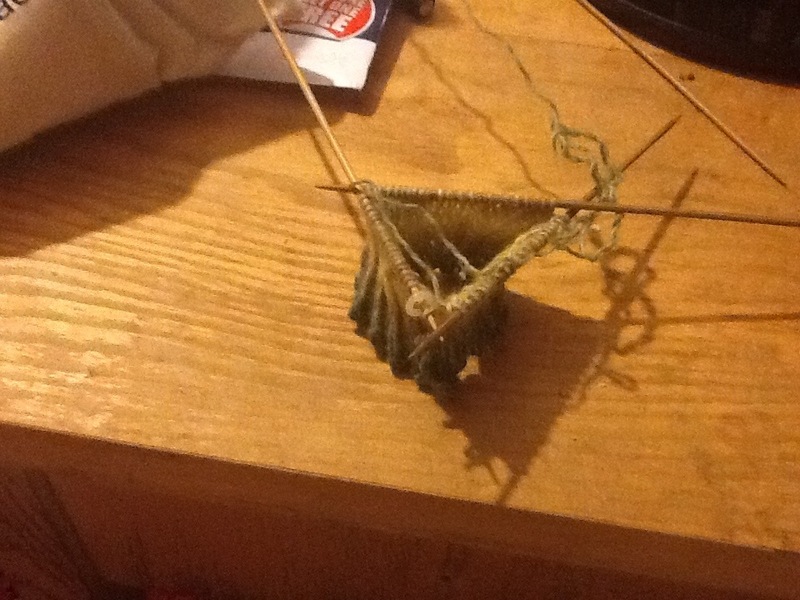 When you start the second round, don’t be alarmed if you do find that the connecting piece of yarn between the end and beginning stitches is long enough to notice. This happened after my last rip, and I despaired at the thought of starting AGAIN. So I puzzled it out, and wrapping this linking section around the left needle and then knitting that and the next stitch as one worked great. Once I got that sorted, the start of the next round was just as it should be. Tell me if you need a pic of this, and I’ll try to recreate it. So once you’ve got the first stitch of the second round, slip a stitch marker on before knitting the second stitch, as shown in the pic. This is the only way I found of keeping it on the needle. See my funky day-glo o ring here, which is all I had that worked. The stretchiness of them works well for slipping from one needle to another, and also worked great for bundling my needles. I may need to acquire more for bundling. As you work, it’s easier to move the needles you’re currently working to the front, and to slide the stitches towards the tip of the left needle and of the one to the left of that so your work doesn’t get the horrible tight stretch that I really struggled to work with. If you don’t do this, you’ll get the tip or long exposed length of the needle to the left of the active ones swinging about in front and blocking the way. You can hopefully see my positioning a bit in the pic, but I’m gonna show that better in the next one. So this is a pic of my progress through round 9 of 16 of the ribbed cuff, and you can see that the working needle are kept in front and the stitches of the other needles are moved so that they form a rough circle without much strain. If you want to do more than 16 rounds of cuff, which makes about 2 inches, there’s definitely enough yarn for that in my pattern if you’re not doing the accompanying gift pouch that I really hope I can cover after. These socks are for me, but I always need more gift bags than I have and it’s good to learn now so I know I can pull it off when I want to make someone socks in a matching bag. It was so satisfying when I did that with earrings, so the more things I can do that with the better. 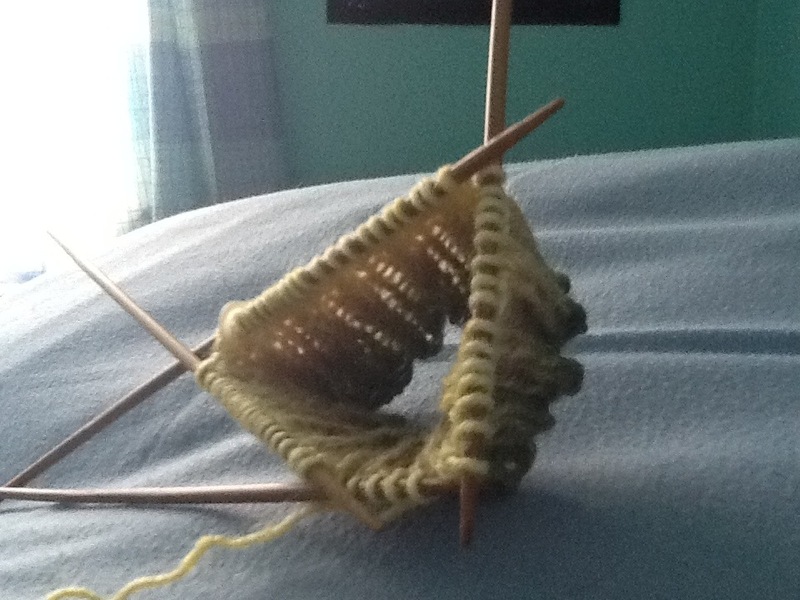 This is what the completed 16 rounds of ribbing looks like. 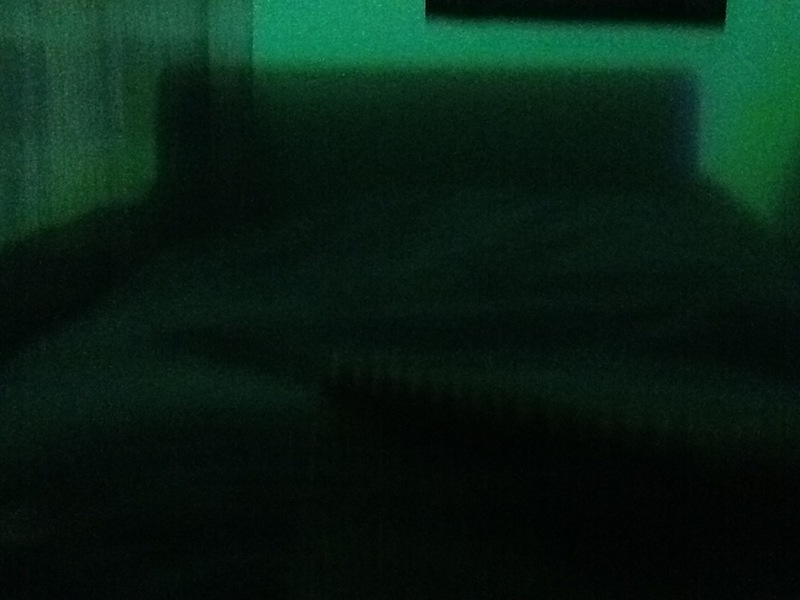 And this is how it looks right way up. If you get to this point and think your cuff’s gonna be a bit short, this is just the top bit of that and the whole cuff is 73 rounds. 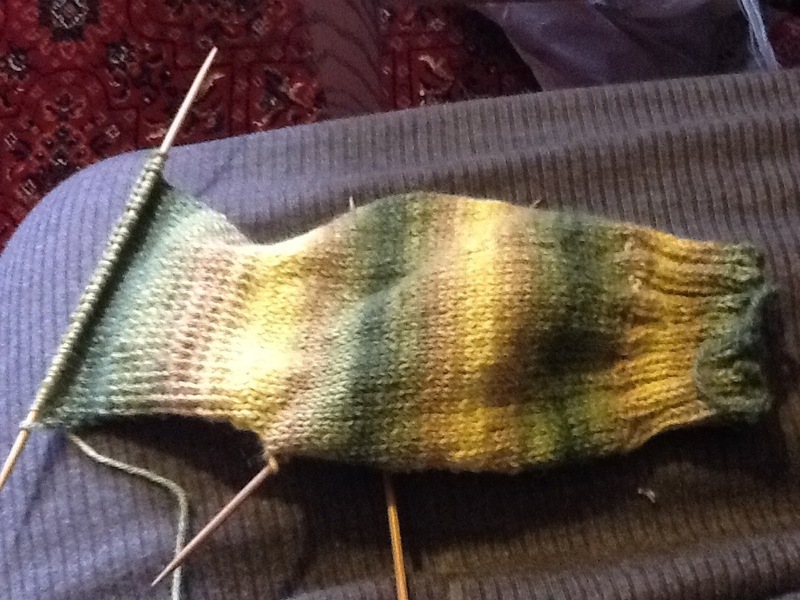 Some socks will have more of the cuff ribbed or even be ribbed all over, and that’s something to explore later. I saw a delish all-over rib pattern that I ache to make. 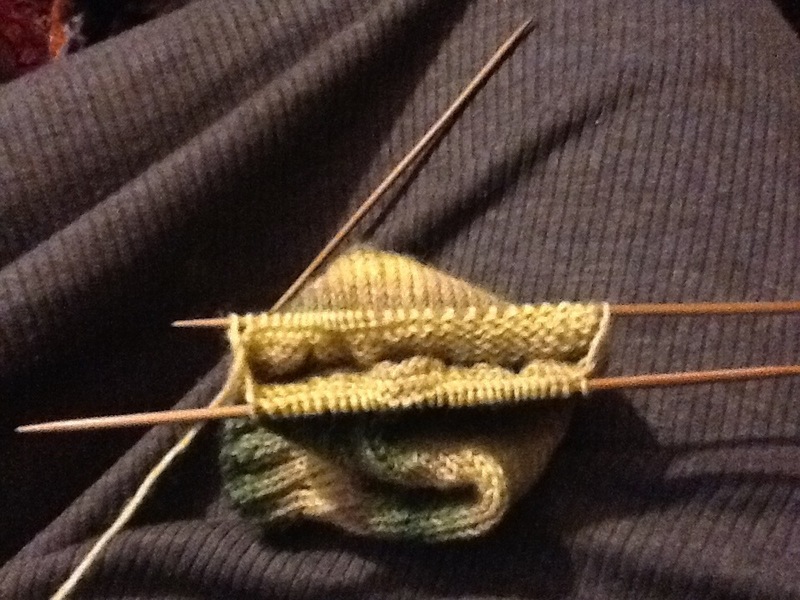 Here I’m working round 8 of 57 for the stockinette section of the cuff. 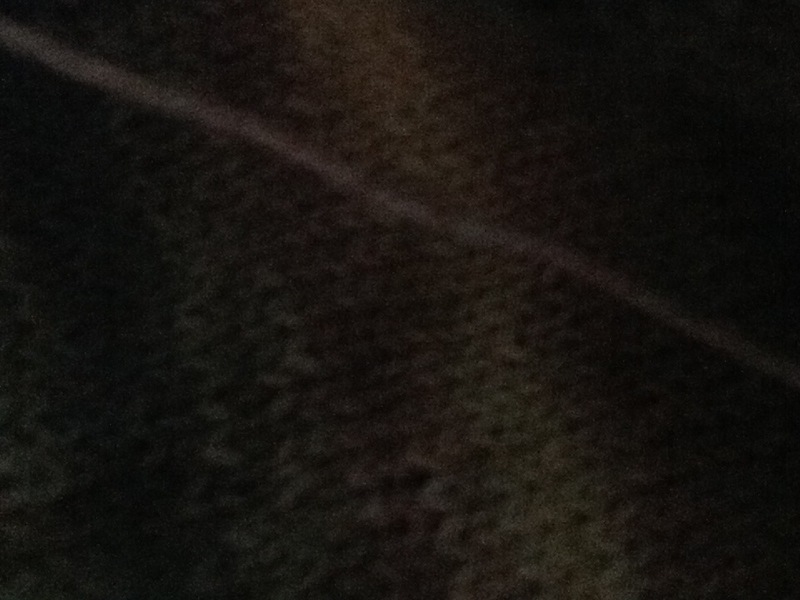 You can see how just knitting every row creates this pattern cos the front is always facing out. The same happens on knitting looms. By this point, you probably won’t need to concentrate quite so intensely so can watch light tv or have a chat while working. If you’re shortsighted, it may help to work without glasses, though, as I ave trouble seeing the fine stitches otherwise. 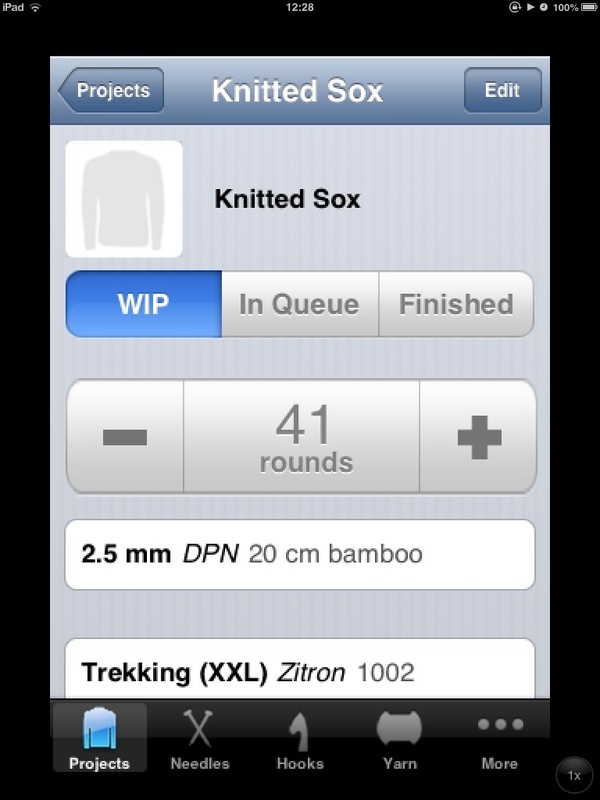 Here’s a screenshot of the app I use to keep track of everything, Vogue Knitting Buddy. 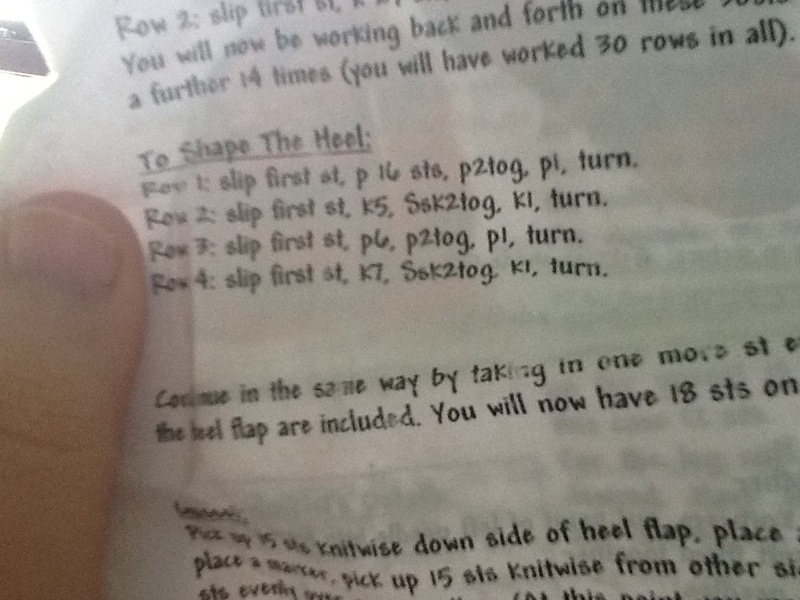 It’s like a lil Ravelry (I’m new there, guess my username) that counts rows, inches, whatever too. That’s 41 outta 73 total for the cuff section. I realised a few rounds later that I made an error, and I feel it’s really petty to undo all that for a really minor imperfection. Can you see it? 49 rows in, the plain stitching is getting boring. And I have another 24 rounds of that to go, even Craftlit cannot relieve the tedium. I get bored easily, so I have a LOT of hibernating projects. What to do? I usually break each piece I make down into how much I have completed, but I can’t do that here cos the crocheted socks I made were all of thicker stuff so worked up differently. I realised at this point that you’d have no idea how long I’d been doing it til I got bored, so I’ll go back and split things by day as much as poss. I will also be putting in the time of each addition in consecutive weeks for the same reason. My stitches are that small and my camera that poor that this is the best I can show my stitches, but hopefully you can see that I’m sticking to gauge pretty consistently cos my stitches are well defined without being gappy. At row 53, I realised that I had 20 rows to finish the cuff and that I could break things down by relating in that way before. I’ve done that before, but I’m not well right now and kinda panicked. I realised that I was not so much bored as concerned when I listened to the part of my brain that was screaming “this looks too long”. So I tried it on my foot for a better idea of fit, then looked up how long ankle sock cuffs usually are. Research shows that cuffs are usually 5-7 inches long, and a couple of measures told me I’d gone far enough. 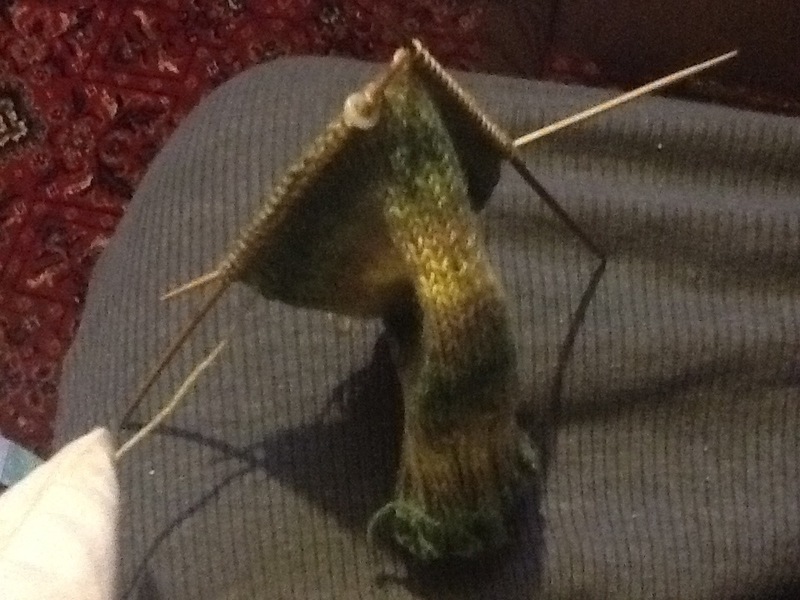 So now for the heel. *Slip 1, purl 29 stitches, slide the rest of your stitches onto one of the spare needles, which is gonna act as a big stitch holder. Repeat * section to make a total of 30 rows. I realised that having all the hanging stitches on one needle makes things too rigid, so divided 15 onto each spare needle. 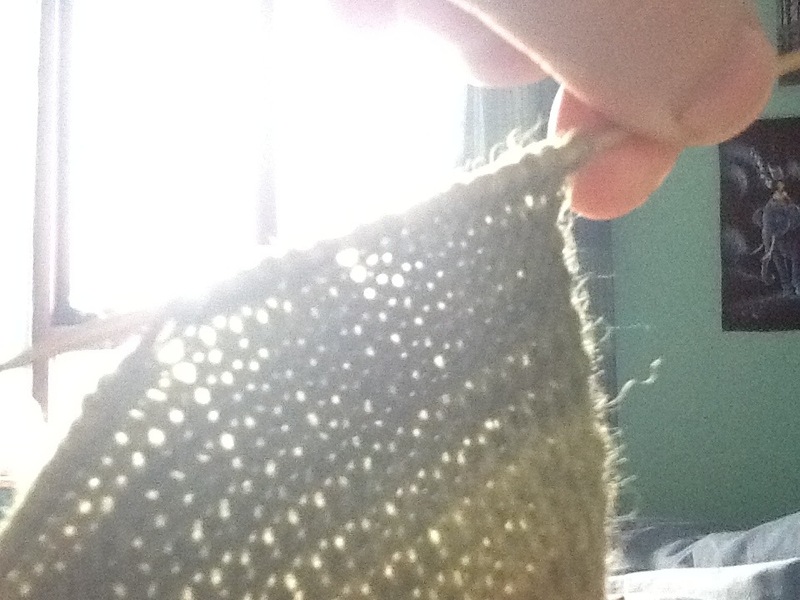 I realised that circular knitting gauge is naturally looser, as I was working my flat rows too tightly. This isn’t really noticeable visually but makes it hard to move the stitches along the needles, so it’s important to loosen up. Coming back after a lil while on WoW, the fineness of the wrong side @ row 7 made me smile. 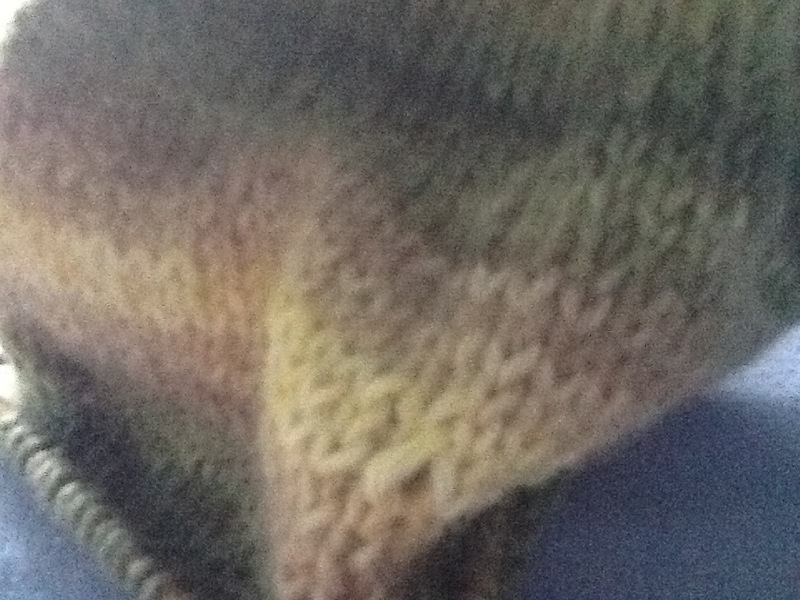 I usually loathe the reverse of stockinette cos it’s big and dull, but it’s so much less so in variegated daintiness. I was really struggling with consistent tension in the flat, but the fact that I couldn’t see it one bit through the viewfinder showed me I was being too critical. So maybe that’s a good thing to do if you can’t tell how important it is. 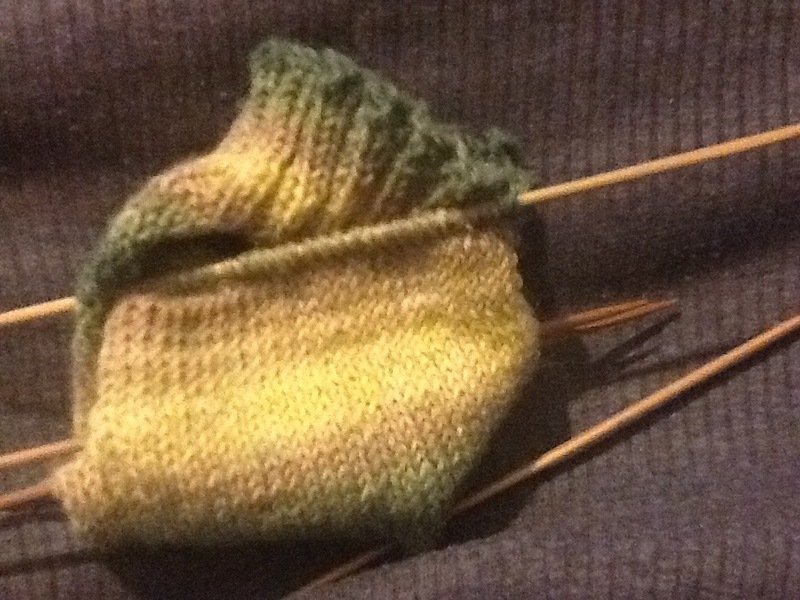 22 rows into the heel flap, and the last photo before bed. Not that I’m stopping yet, but I’ll have to at row 30 cos this is what a photo taken from my iPad with just my lamplight looks like. I was trying to set up a handwarmer on aluminium this morning, and I just got why I was having trouble with it and why I failed to work socks on the darned things. The problem I have with aluminium for circular work is that things that are niggles with straight work are magnified there. I failed to knit slipper socks before cos the heavier aluminium slipped right through the stitches so much that it brought about a rare bout of swearing, and they’re also that bit clumsier because the very fact that they’re a rigid material means that they work against the yarn a bit. And that’s not just a metal thing, I found birch to be harder work too. Just realised why I’m enjoying using the dpns best for flat work, compared to other styles of needle in the same material. They’re more equally balanced, so are gonna make lighter work of it. Nuh-night. This is what my work looked like when I laid it down last night. 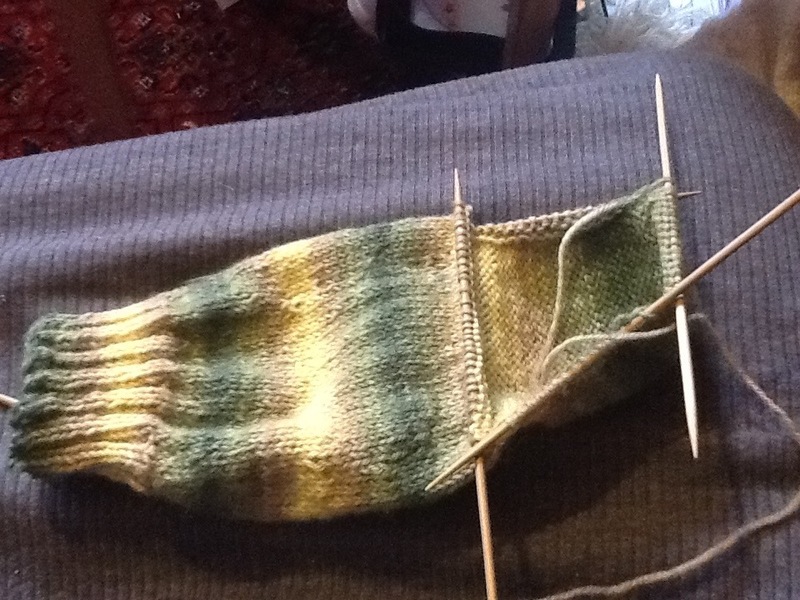 That’s the heel flap done, now for the shaping. Starting on the wrong side again, I slipped the first stitch, purled 16, purled 2 together, purled the last stitch, and turned. On the next row, I slipped the first stitch (this makes a smaller amount of larger stitches for picking up), knit 5, then stopped because I couldn’t remember how to SSK. I’m gonna have to reread my own earlier post to check that what I just tried to do is in fact correct. I dunno if my brain is just super foggy or what, but I couldn’t understand my own instructions, so Lion Brand showed me how. 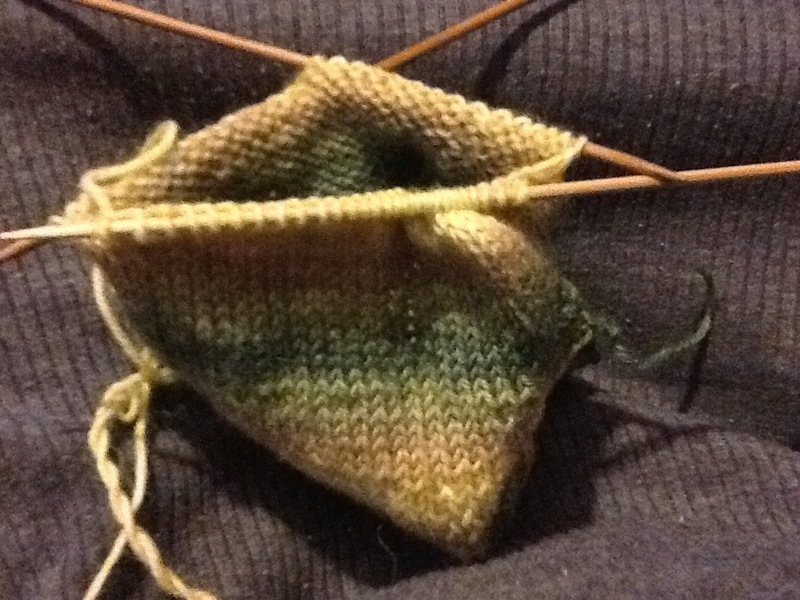 So slip the next 2 stitches, knit them together through the front loops, knit 1, turn. 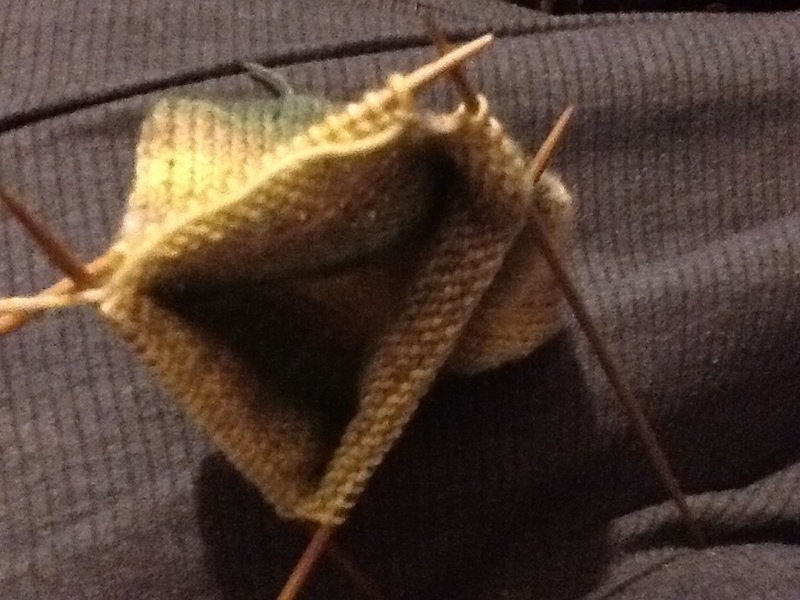 So that sets up the extra stitches at the sides, which will be picked up and decreased over as you go. I then slip the first stitch of each row, work stitches until 1 before the gap, then decrease with SSK on right side and p2tog wrong side. This is gonna go on until there’s no more stitches I can decrease over. 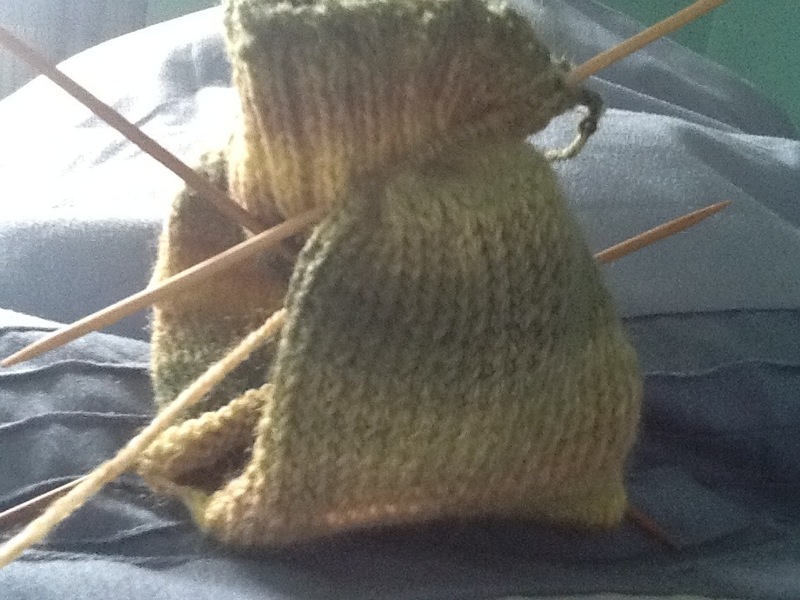 So that’s the heel decreases done. It looks weirdly long at this point, cos it’s not yet in the natural position. And this is where I am in the pattern. After I realised that picking up those larger slipped stitches involves knitting rather than just sliding a needle in as I initially thought, I picked up the 15 stitches by putting my needle through from the bottom so that it sits between the two loops of each stitch. 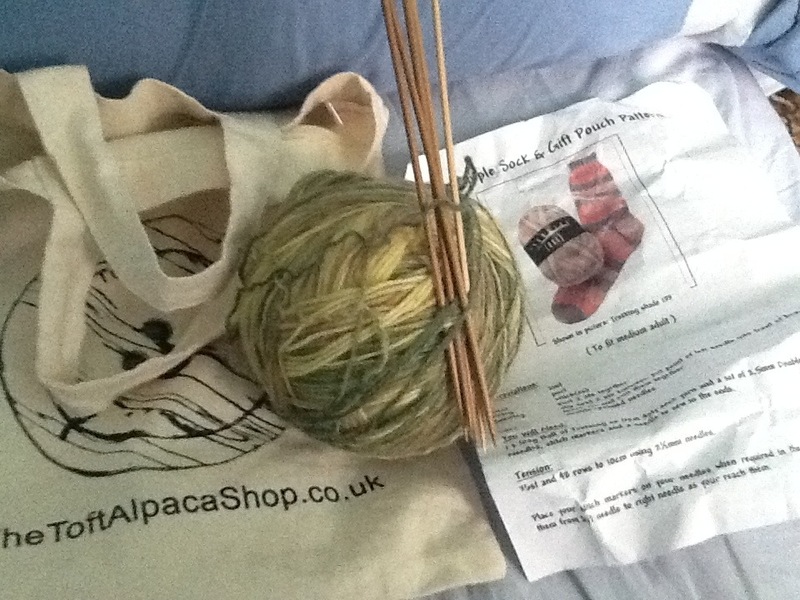 It’ll be easier if you can use 5 needles here, and knitting firmly minimises holing. 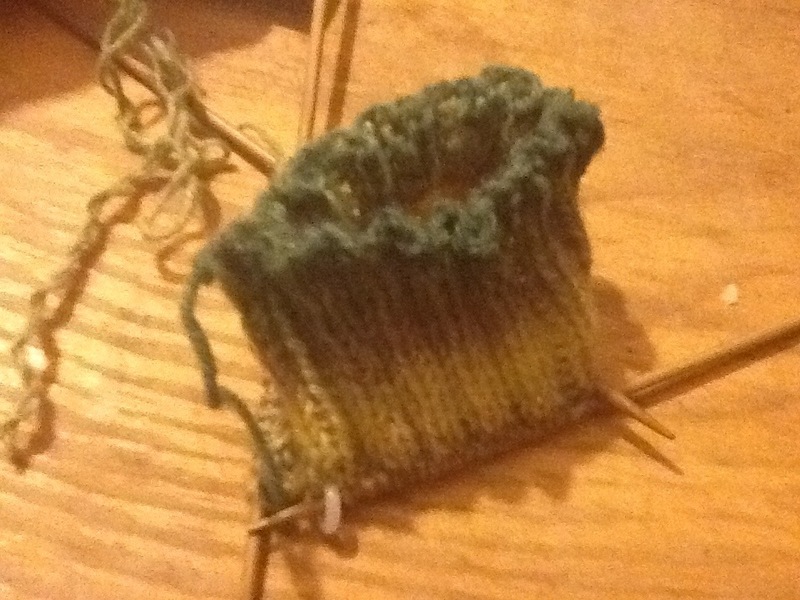 I then knit the 30 remaining cuff stitches onto one needle, and picked up the 15 slipped stitches from the other side. Now we’re set up for working in the round again. My pattern mentioned placing 3 markers, but I wanna discover how important that is and why. I’m learning all the time see, and other patterns have demanded markers where I just didn’t need them. Don’t forget to knit a lil tighter in the first stitch to join, then knit to three stitches from the end of second needle, knit 2 together, knit to end of 3rd needle. At this point, I realised that stitch markers would help if working with 4 needles, so you’d need to work to 3 stitches before end of side there. 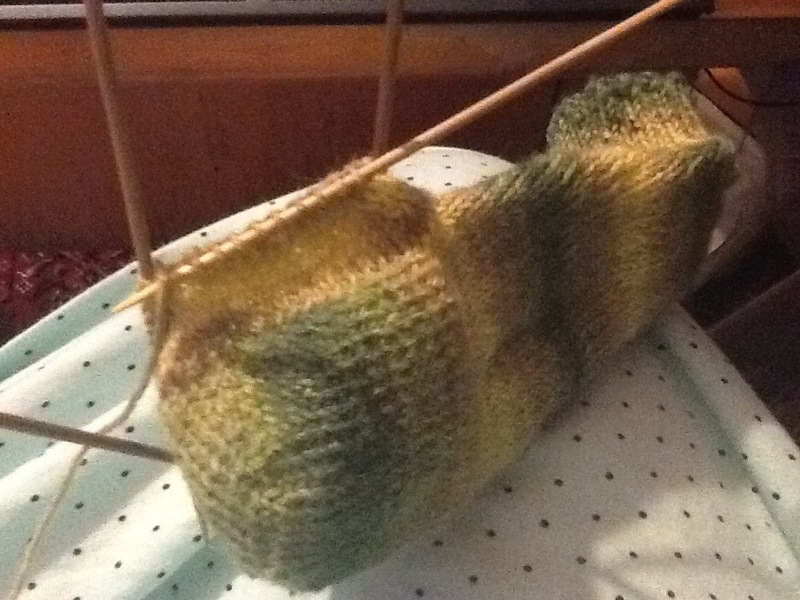 If you get any visible joins, wrap the yarn and knit with the next stitch as before. 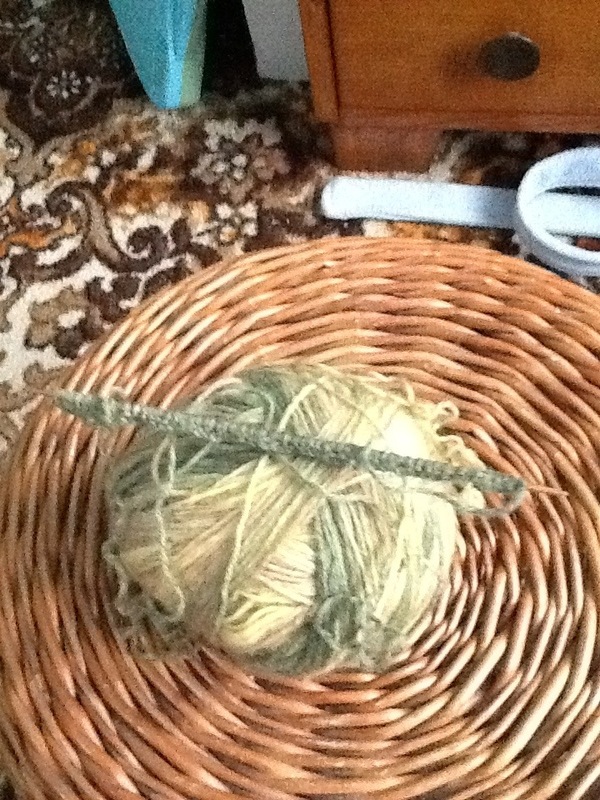 So knit the first stitch, SSK, then knit to the end of the round, then knit the next round. Aaand repeat 1 round of decreases, 1 round plain until you’re back to 60 stitches. Turn your counter to 74, which is how many stitches you’ll have after the first round, and lower the number by one after each decrease. 71 stitches. I keep falling into the rhythm of the plain rounds, which is fine until I forget to decrease. Partway through the plain round of 66 stitches. 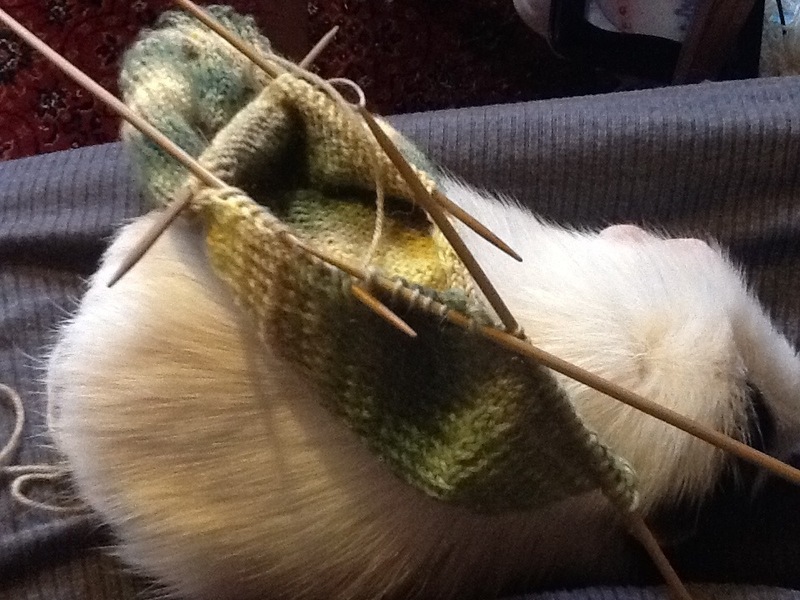 This entry was posted in knitting, Learn alongs. Bookmark the permalink.